I thought it’d be nice to interject a few funny antidots. I did say in my last post I didn’t exactly live the life of a normal person with a disability. Here’s an example. This one takes us to the firing range up in Kilbride. The following is unofficial and never happened if anyone asks. If you recall back in the mid 1990’s I was in the Air Corps. A year after I’d initially lost my sight the lads thought it would be great craic to bring me on annual range practice. They were going anyway so why not bring me. Now you must remember this is the military, so they don’t just let anyone on the range, you must pass a test every year. Off we went to the depot for our annual war week – fitness test, rifle drills, we did other stuff too, but I can’t remember what. Anyways for a day or two you go through all your rifle drills, stripe and assembly and safety drills, then you are tested to see if you are competent enough and safe enough to go on the range. The NCO’s were trying to figure out how I was going to get through all this. The Steyr is not that complicated and the safety checks were second nature anyway. However, some of the little parts were a bit problematic when it came to the stripping and assembly, but I got through it. Sure, in theory you’re meant to be able to do all this blind folded. Forgive the pun. Well I past the tests much to the amusement of everyone. But the depot NCO’s were like ‘hmm ok, but we know you can’t see through the optical sight’. ‘I can do it, trust me’ I said. Of course, my right eye is a lot worse and that’s the eye you look down the sight. I said, ‘I can use my left eye’, eh no that wasn’t going to work. The rifle isn’t geared for left sighted people although you can get them. Mind you it would have made no difference I can’t imagine my left eye being able to see the target either. And trying to use your peripheral vision doesn’t exactly work either on the range. Anyway, off we went. For most of the day on the ranges I was put filling magazines under the armourer Sergeant (As this never happened I won’t be putting down his name). I didn’t mind. He was sound, and I felt useful. For those who don’t know what happens on the range, it’s not like here’s a hundred rounds off you go. There are several distances you have to fire from – 100m, 200m, 300m. Then there’s a whole sequence of practices such as ten rounds at 200m. It goes on and on. For me and the Sergeant it was a day of fifty magazines with five rounds, another fifty with twenty, another fifty with twelve. (I can’t remember exactly the sequences or what went into what). While some of the guys were on the range, others were in the butts putting up and down the targets, indicating where the person hit and then putting a patch on the hole. Then everyone swoops around. After a while I was like ‘um excuse me when’s my turn. I did pass the test’. There was a bit of a discussion amongst the NCO’s. ‘Come on so’. Onto the range I went. But just to make sure I at least fired in the right direction one of the NCO’s stood over me. Needless to say, I could not see the targets at 300m or 200m. But at closer distances I could make out the mountain behind the range and I knew from being there before the white line and the mucky colour was the targets and the earth behind them. At 100m though I could kind of make out the general direction of the targets but not through the sight, which was frustrating. The lads in the butts (the sheltered area underneath where the targets go up and down) were warned I was firing and to take cover. I’m not kidding. They told me after laughing that there was muck flying everywhere in the butts. They said I hit everything but the targets and there were ricochets all over the place. Funny as hell. Every now and then the NCO who was standing over me would tip the rifle up or down. Just to be clear I was pointing it straight and there is a big mountain behind the Kilbride ranges, and no, no sheep were harmed in this exercise. Then the NCO’s from the Apprentice School were like ‘Wes come on with us, we have a job for you’. Up to the pistol range we went. “I’ve already filled these magazines so what crappy job am I going to get landed with” I thought. ‘Here you go Wes’ and they handed me a BAP. Pistols are great craic. You get to stand at 50 - 25m if I remember correctly. All rounds hit the target, I swear. I was however standing about 20m from it. The silhouette man that was the target I think got away scot free. The silhouette man beside my target went down big time. I’m not sure who got more fun out of this me or the Apprentice School NCO’s. If you thought some of the guys in my class were wired, you should have met some of our instructors. 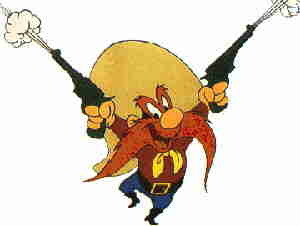 So that was my impression of Yosemite Sam. Not the first or the last time we got up to antics like this. Remember this never happened if anyone asks. Next time I might tell you about the time the lads gave me driving lessons around Baldonnel. Or there was that other time the drivers from Transport gave me lesson in the Nissan patrol when we were in Ballymullen Barracks in Kerry. I took it too far, apparently starting up the Civil Defence fire engine was not a good idea. There’s plenty more funny tales to come.